Eating healthy is about more than managing your weight or preventing heart disease. The truth is healthy eating plays a huge role in your overall dental health. Patients who eat processed foods that are high in carbohydrates and sugars have a much higher rate of decay, as well as oral yeast infections. A healthy diet combats these problems and ensures your teeth are strong and healthy, so you don’t undergo unnecessary procedures or have to pay for extensive treatments. 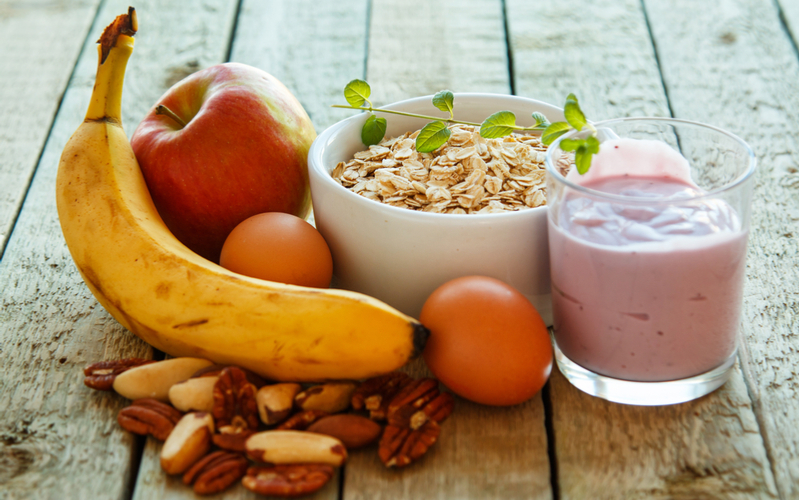 Here are some simple rules to follow that make creating a healthy breakfast simple, even on your busiest days. Keep it balanced | Focus on creating a meal that is completely balanced. Many people tend to favor carbs in the morning and neglect proteins, which keep you full longer. Make it a point to include a protein (eggs, low-fat bacon, turkey sausage) and a complex carb (oatmeal, sweet potatoes) in not just your breakfast, but also every meal. Prepare ahead of time | The more you can prepare ahead of time the more likely you are to be successful in your attempts at eating healthy. You can bulk cook oatmeal and sweet potatoes and even turkey sausage can be made ahead of time. This means all you have to do is quickly cook some eggs and you’re good to go. Look for hidden sugars | Things like jams and jellies as well as cereals all tend to have hidden sugars that can cause cavities, especially if you eat and don’t brush your teeth for the rest of the day. Rinse after you eat | After you eat, make it a point to brush your teeth or rinse your mouth. This helps to remove any food particles and sugars that might have coated your teeth. Enjoy coffee | Enjoy coffee (you probably thought we’d say stay away from it), but be sure to rinse after you drink coffee so that you don’t leave any residue that can stain or eat away at your enamel. Start your day hydrated | Before you start to eat breakfast or have coffee, have a tall glass of water. This kick-starts your metabolism and helps you feel a little full so that you don’t overeat at breakfast. Make breakfast fun for children | Children are constantly tempted by sugary treats. You can make healthy choices fun by encouraging children to have fun at breakfast time. Encourage them to help cook or come up with healthy recipes. While eating healthy can be daunting, it’s the best way to ensure you’re setting yourself and your family up for healthy teeth. In the long run, this results in easier dental visits.